Madesi is an Argonian pawnbroker and a stall merchant selling jewelry in Riften. He has a rivalry with fellow merchant Brynjolf, a member of the Thieves Guild whose "miracle cures" have been drawing business away from Madesi. 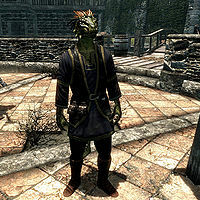 If your character is an Argonian, he will refer to you as "marsh-friend". Otherwise, he will call you a "land-strider". He will ask for your help in collecting supplies for a new ring he wants to make, and will reward you with 400 gold and a leveled necklace. His disposition towards you will also increase. He gets up at 6am and heads to his stall at the grand plaza. While tending the stall, he can be found conversing with his customers and trying to interest passersby to buy his jewelry. At 8pm, he closes his shop and eats at Haelga's Bunkhouse until midnight, then goes to sleep in Beggar's Row. Madesi wears a set of merchant clothes and a pair of boots, and is equipped with a leveled dagger which can be up to elven quality. He carries the key to his stall, a belted tunic, and a selection of common items and gold. When idle at his stall, he will promote his goods, saying, "Beautiful baubles and gleaming gemstones over here! ", "Jewelry with legendary Argonian craftsmanship! ", and "Buying and selling fine jewelry here!" Approaching him will have him say to you, "If anything pleases the eye, don't hesitate to make me an offer. ", "If you have any jewelry to sell, I'd be glad to pay you a fair sum in gold for it. ", or "Greetings, honored friend. Could I interest you in some fine jewelry?" If you see him when he is not working, he'll also tell you, "Come see me in the market if you're looking for the finest custom jewelry in all of Skyrim." Upon ending conversation, he will wish you, "Safe travels, landstrider." if you are not an Argonian, or "Good journey, marsh-friend." if you are. Asking him about his business will be replied with "Not well I'm afraid. That Brynjolf... he keeps draining the people's pockets with his ridiculous miracle cures. A few months ago it was troll fat salve and now he's got something new. Not that there's anything that can be done about it. He's in good with the Thieves Guild." "I have your flawless sapphires." "Good, these will make wonderful settings for my rings." "I have a mammoth tusk for you." "The ivory from this tusk will be perfect for the inlay on my amulets." "I have a chunk of gold ore for you." "Perfect. Melting this down will give me plenty of gold for those necklaces I started." Once you've brought him everything, ask him if he needs anything else and he'll reply, "No, I think I have enough here to get started. Here, let me give you this. It's the least I can do for all your trouble." He will reward you with a leveled necklace. If you ask him about the term "Saxhleel", and you are not an Argonian, he'll respond with "Forgive me. It's a term I haven't used in some time. While most in Tamriel call my kind Argonian, we prefer the term Saxhleel." If you are an Argonian, he'll instead respond "Forgive me. It's a term I haven't used in some time. While most in Tamriel would call us Argonian, we prefer the term Saxhleel." Either way, he will continue by explaining, "Madesi was actually my original Saxhleel name. Unlike others, I decided to embrace tradition and keep it that way." During A Chance Arrangement, you will be asked to plant Madesi's silver ring in Brand-Shei's inventory, while he and Madesi are being distracted. Nordic JewelryCC: Learn about Nordic jewelry. Ringmaker: Help Madesi make jewelry. There is a "Loot" shadowmark on his market stall. He is unaffected by the Master Trader perk. His vendor service faction hours in Riften do not match his assigned AI schedule. Dinya: "When are you going to stop by the temple, Madesi?" Madesi: "Sorry Lady Dinya, but I've been busy of late." Dinya: "It only takes but a moment to say a silent prayer to Mara. Please come by soon; not for me, but for yourself." Madesi: "Very well, I'll try milady." Mjoll: "Madesi, my friend. How have things been since last week's incident?" Madesi: "Ever since you scared off that thug from the Thieves Guild, not one of them's bothered me. We're lucky to have you here." Mjoll: "It's my pleasure. If you see the Thieves Guild harassing anyone else, you be sure and let me know." Madesi: "Lady Maven, how may I help you?" Maven: "Is it true that you refused to sell one of your... trinkets to Hemming?" Madesi: "Please, milady, it was only because he threatened me. He said he'd have me thrown in the prisons if I didn't give him what he wanted! I can't afford to just give my jewelry away!" Maven: "Next time a Black-Briar asks for something, I suggest you respond quickly and affirmatively." Drifa: "Oh, I'm so sorry. I'm certain Bolli would be happy to lend you a few septims." Bolli: "Madesi, what's this bill for 300 septims!" Madesi: "Begging your pardon, milord. Your wife has run up quite an account in the last few months." Bolli: "Outrageous! Who does she think she is?!" Madesi: "I believe she's trying to look as ravishing as possible for you, milord." Bolli: "Oh, well... I suppose that's a noble cause. I'll settle this bill at the end of the day. Thank you." Grelka: "Hey, greenskin... close your mouth. Some of us are trying to eat over here." Madesi: "There's no need to be rude, Grelka. If you don't care for Argonians, then perhaps you should take residence somewhere else." Grelka: "Or perhaps you should crawl back into whatever swamp you came from, lizard man." Madesi: "You're not going to goad me into a fight so I'll get kicked out, Grelka. Eat your food and leave me in peace." This page was last modified on 31 August 2018, at 18:51.